'No better time than last minute'... seems to be my motto lately! 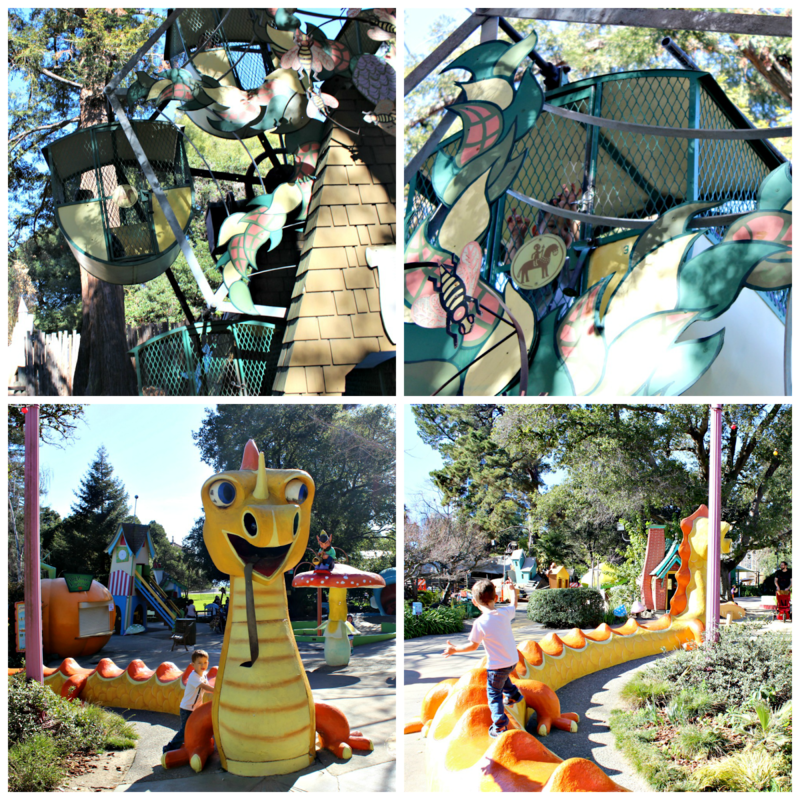 So here we are with my monthly Bay Area Kids Fun post! I didn't do much research before going, so I really had no idea what to expect. Since I started doing these reviews, I have made a conscious effort to not look up anything about the places. It keeps my biases to a minimum and my expectations low. I had never even been to this general area of Oakland before, so I was pleasantly surprised by the surrounding park as well. You could easily fill a whole day with Fairyland and the pond, recreational park, paths, etc. around it. When we arrived, we got a quick tour of the whole park, and I was really shocked by how big it is. And they really use all the space so well. I was very impressed with all that they fit into 10 acres. Our tour ended at the back of the park, so we started our playing at Old West Junction. This is the most recently added attraction and one of my favorites. 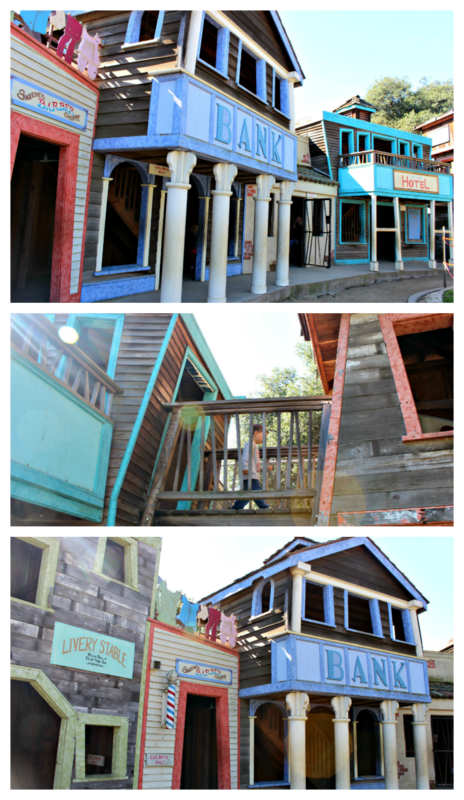 It is set-up just like an old western town, complete with jail (Myles' favorite), bank, horse stable, and a two story slide! 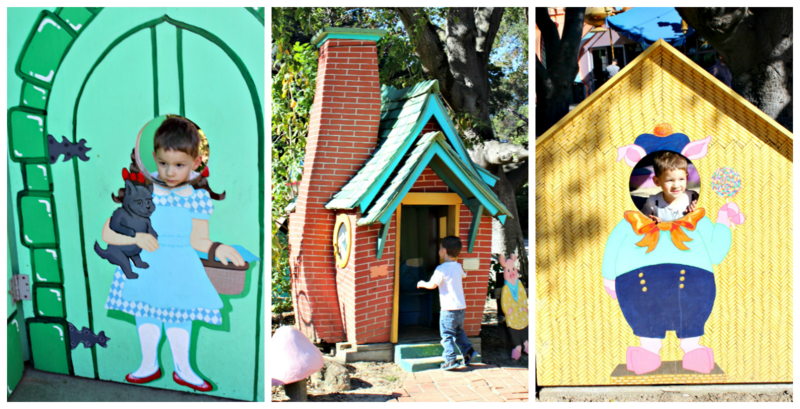 We also saw our first talking storybook box here. You can buy a Magic Key ($3 and its yours forever) that will allow you to listen to a story/song (in English or Spanish) at just about every attraction/area. 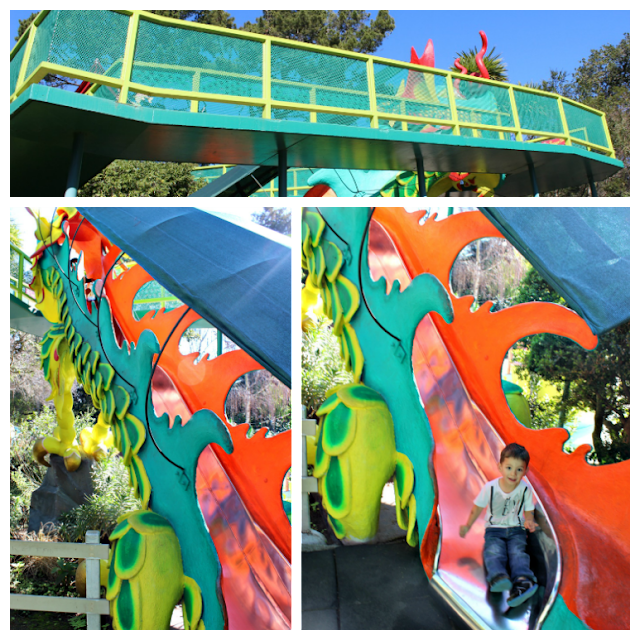 Next up was the Dragon Slide. It's a pretty big slide and looks even more intimidating. I wasn't sure Myles was going to do this one on his own (children under 4 and no adults to help), but Mark walked him up and he took it on with no problems. He even wanted to do it again! I secretly wish I could have given it a try too! And we, of course, had to ride the train. He waited very patiently for a looonnnggg time to get on this thing. It's a short trip, but you get to go around twice and the track goes through the coal mine behind the Old West town! This is also their oldest ride (opened in 1954)!, so the wait was worth it! Myles also took a ride on the carousel. And because there was no line, he rode two times in a row. 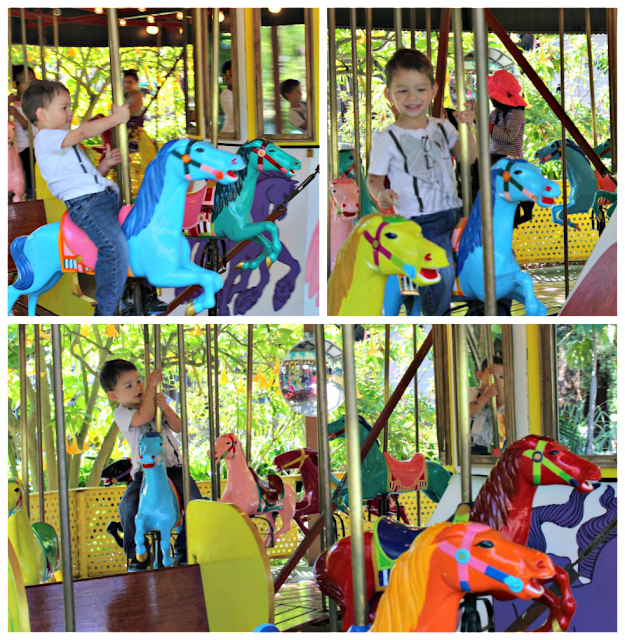 No adults allowed on this ride :( , but it is extra cute seeing the little ones on those mini-horses! I'm not sure why exactly, but Myles was obsessed with Willie the Whale. He just kept walking up and down the stairs and then standing at the bottom for minutes. Every time we tried moving on, he just wanted to keep going back to that darn whale! No adults allowed on Anansi’s Magic Web, so I was certain Myles wasn't going to go. But, I was wrong again! He loved every second as he was yelling 'hi mom and dad' even at the very top! And no lines here either! This dragon reminded me of my favorite green dragon: Puff! If you pull his tongue, he tells a story. And that little guy on the mushroom behind the dragon blow bubbles! Another favorite of mine: Jack and Jill Hill. 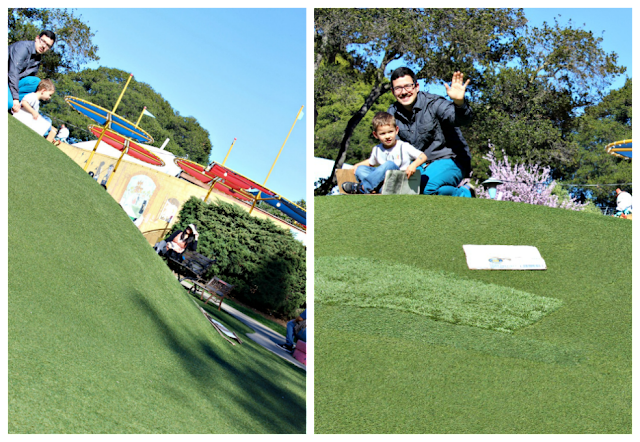 Kids can slide down the green grass hill on cardboard. Myles got creative and went on his belly and even 'surfed' down the hill! Next, we had to say hi to all the animals! 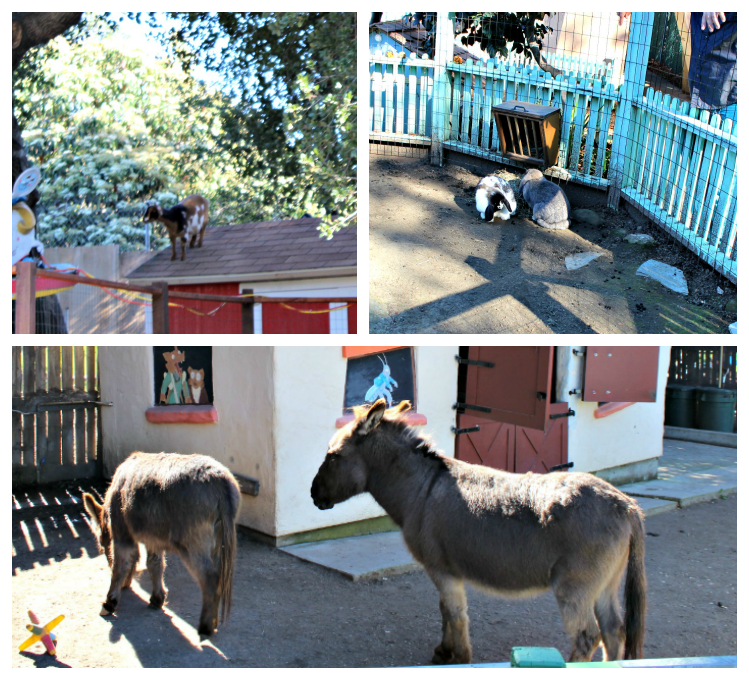 Bunnies, goats, mini ponies are just a few of the 15+ animals that are housed at the park. As we moved through the park, we played out our own stories. Myles got in on the action of The Wizard of Oz and the Three Little Pigs! He makes a darling Dorthy! 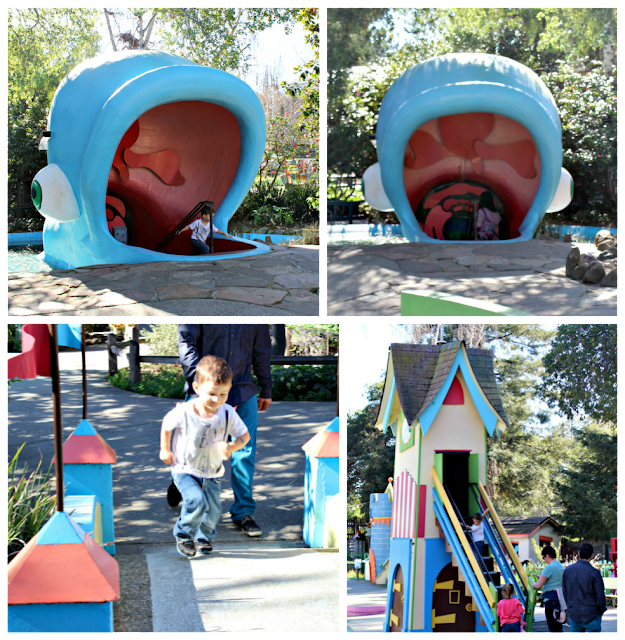 Another favorite of mine was the Alice in Wonderland Tunnel. 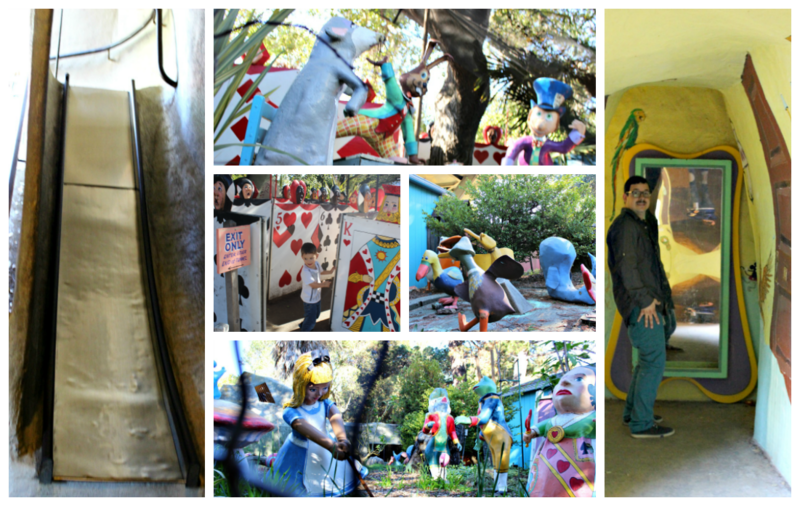 You can travel down the rabbit hole on a slide and live out the story through mini scenes of Alice's adventures. And at the end you must make your way though the card maze (the best part)! Our last stop (before Myles could no longer go on!) 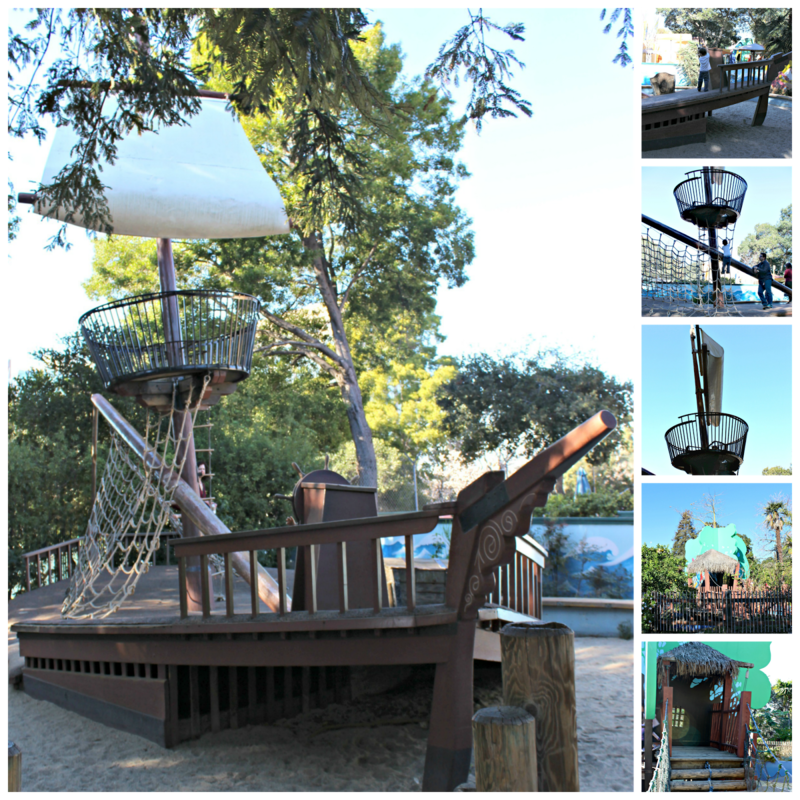 was the Jolly Roger Pirate Ship and Play Island. Both are sand-based attractions with boats and ropes. Myles really loved the pirate ship (possibly his favorite) and even dad got in on the action. He climbed the rope ladder, but then backed down at the top when he saw the crow's nest. I was really hoping to get a picture of him up there, but he wasn't having it. He did have a great time steering the ship and keeping away from the croc! We spent a good 4 hours here but by that time, Myles was completely pooped and out of energy to play. Luckily, we did get to see mostly everything, but next time we go we will start where we ended, so that he can properly explore those attractions with more energy. Daily puppet shows (Storybook Puppet Theater): opening in 1956, it's the oldest continuously operating puppet theater in the U.S.
Emerald City Stage: storytellers, magicians, comedy acts, singers, clowns, etc. A different act every weekend. We caught a glimpse of a folklore storyteller, but Myles wasn't patient enough to sit through it. Fairyland Personalities. Children 8-10 years old perform stories from folklore and children’s literature. Runs from June-October. Possibly abnormal, but we experienced no crowds or lines (except the train) on a Saturday. So much to do: so many attractions, rides, play areas; something for all ages! A ton of entertainment for your money: rides, acts at the Emerald city stage, puppet show, children's theater are all included in price. Lots of areas to picnic or relax and a ton of shade. All outside, so perfect way to spend a day for the kids, but also enjoying good weather. Staff is very friendly and engaged. All outside, so if it is cold/rainy, a no-go. Parking is shared with the whole park, so it is hard to find a spot, even on a non-busy day. I have to give this place a 9 because, it was hard for me to think up any cons! I was racking my brain, and it was just not happening! I love that it is all outside: get to enjoy the sun, but some shade for hotter days. Absolutely no shortage of fun and entertainment, for a reasonable price. Something for all ages and interests with tons of imaginative and physical play. We will definitely be going back for more! I LOVE that you are taking the time to read and comment on my blog! I always comment back either through email or as a reply on your comment :) Thanks for coming by! 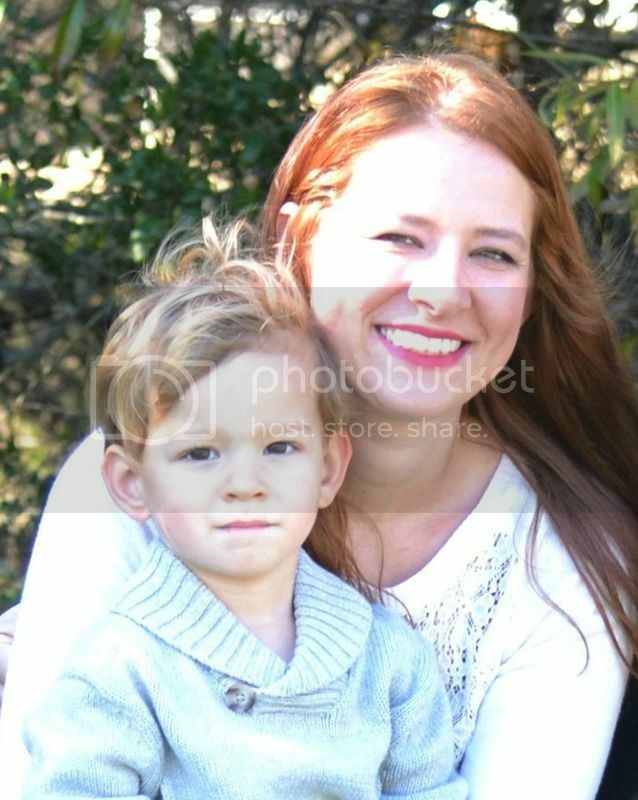 Some posts here at The Everyday Momma contain affiliate links. I am also provided some products for testing and reviewing purposes. However everything you read here is 100% my honest opinion! Copyright © The Everyday Momma. Blog Design by KayLuxeDesign.